What is scorpion? What is it used for? The scorpion is a land-based animal with an elongated body, strong claw-like appendages and a curved tail that ends in a venomous stinger. They are found throughout the world and can live in a wide range of environments, including deserts, grasslands and rain forests. 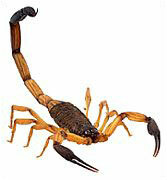 The average size of a scorpion is approximately two inches in length, although some species can grow much larger. They are largely nocturnal animals, and range in color from yellow to light brown to black. Scorpions are usually caught in the spring or autumn, then boiled and dried in the sun. In traditional Chinese medicine, scorpion has pungent and neutral properties, and is associated with the Liver meridian. It is extremely toxic. Scorpion is used to stop spasms and subdue endogenous wind, and to dispel toxins and wind. Scorpion is sometimes combined with other herbs as part of a larger formula to treat convulsions and spasms of the hands and feet. Some practitioners may recommend scorpion as a treatment for headaches and pains in the joints. How much scorpion should I take? Scorpion is usually decocted in water; the usual dose is 0.6 to 1 gram. Larger amounts can be used if powdered scorpion is being applied externally. What forms of scorpion are available? Powdered scorpion is the most common form of the product available. Whole, dried scorpions can be purchased at some Asian markets and herbal shops, but they are extremely difficult to obtain. What can happen if I take too much scorpion? Are there any interactions I should be aware of? What precautions should I take? Scorpion is considered quite toxic. It should never be taken by women who are pregnant or breastfeeding, and should be used with extreme caution in all other instances. As always, make sure to consult with a licensed health care provider before taking scorpion, scorpion powder, or any other herbal remedy or dietary supplement. Gao YH, et al. Treating 198 cases of epilepsy with xi feng ding xian wan. Hebei Journal of TCM 1991;13(4):42-44. Wang NW, et al. Therapeutic observations on treating 79 cases of apoplectic sequelae with combination of Chinese herbs and acupuncture. Journal of Traditional Chinese Medicine Information 1988;(1):22,10. Xing GS, et al. Treating 19 cases of epilepsy with combination of acupuncture and herbs. Journal of Acupuncture Clinical Application 1999;15(3):13-14. Yu LH, et al. Treating 18 cases of epilepsy with ke xian wang capsules. National Journal of Medicine Forum 2000;15(1):37. Zhou BM. Treating 228 cases of apoplectic sequelae by applying zhongfeng plaster on acupoints. Shanghai Journal of Acupuncture 1991;10(2):15.